Posted on August 5, 2018 August 4, 2018 by SherylPosted in FoodTagged cucumbers, recipes. Interesting recipe. We’re having a cucumber shortage and they cost about $5 a pound. I’ll try this next Australian summer. Interesting. I never would have thought to cook cucumbers. Thanks for sharing. This sounds great. The next time we are gifted with an overload of cucumbers, I’m going to try this. Of all the dishes I’d never imagine, this one’s right up there. “Cooked cucumber” seems an oxymoron. Maybe I’ve heard the expression “cool as a cucumber” too many times! The recipe seems so odd I’m going to have to try it, just to see how it turns out. I am really trying to imagine it. Not going well. 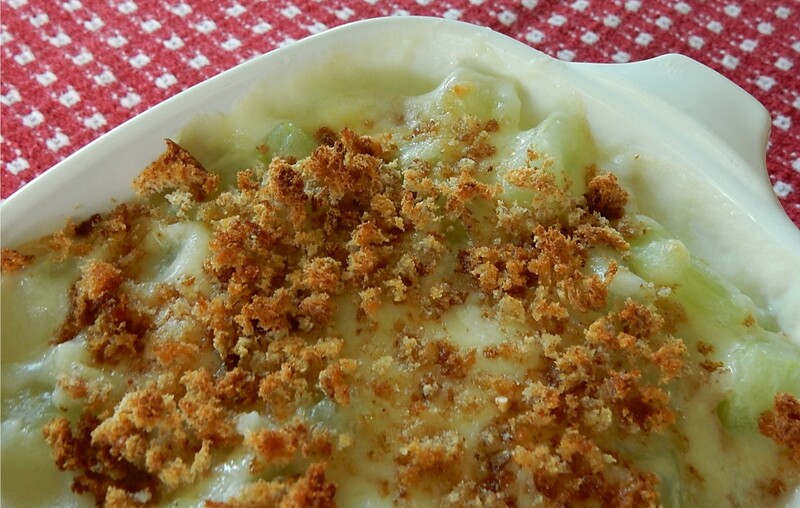 Scalloped cucumbers….now that is something I’d never think of! You’re so right – we do need to keep an open mind when using certain vegetables. This is an interesting recipe, which reminded me that a few ago I’ve had stuffed cooked cucumbers in a Persian restaurant, and they were delicious. Wow! Never heard of cooked cucumbers! Yum! I have had stir-fried cucumber which was delicious, so I can imagine this dish would be nice. Not to be tried yet as one cucumber costs $5. This sounds delicious to me. Probably more because of the white sauce than the healthy vegetable– but yum nonetheless. Never thought to use them this way! I guess we are blessed with so many things on hand ,and if we don’t .then the grocery does…that we aren’t forced to be as creative with food as back then. That’s a surprising recipe!! And the ingredients are quite suitable for my current diet…one to try! I will try this. I will have lots of cucumbers this month from my deck garden! I cook radishes and they’re wonderful! I’m definitely going to give this a a try.